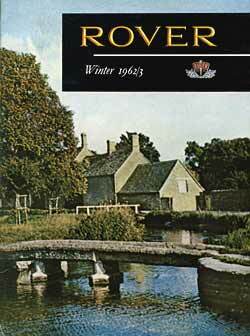 Rover car company in-house magazine for 1962 / 1963. Homepage. This page: A rare copy of the in-house Rover car company magazine for the Winter of 1962/1963. Rover & Land Rover cars magazine. Whereas in later years, Rover sank to being just another automotive brand in the British Leyland/Austin Rover/BMW portfolio, sharing dealer floorspace with Maestros and mid-range repmobiles, in the early 1960s they were still a proud and independent motor company. Their cars were chosen by the professional classes for their fine build quality, if not perhaps for their cutting-edge design (until the advent of the P6 anyway), whilst country dwellers couldn't get enough of the four-wheel drive Land Rover. The motoring magazine featured on this page dates to the winter of 1962/1963, and was an in-house publication, written for, and distributed to, Rover dealers both in the UK and overseas. This was at a time when Rover was trying hard to shake off its Bank Manager image, the all-new P6 was being readied for sale later in 1963, and the back-room boffins were earnestly at work, fiddling with their slide rules, conducting experiments with gas turbine-powered road and race cars. These were exciting times for the Rover car company. Not content with just seeing their cars providing sterling service on the road, a number of Rovers were adapted for motorsport duties. Several rally-prepared cars are featured in this issue, as are the gas turbine development cars. Land Rover and the Bluebird LSR attempt. Inside the front cover is a photo of a short-wheelbase Land Rover hard at work, axle deep in mud in an ironstone quarry, this 4x4's natural environment. By the early 1960's the Landy had evolved from the original Series 1 of 1948, into the Series 2, and recently-introduced variants such as the forward-control Land Rover were proving popular, as were the lwb twelve-seaters, also added to the catalogue in 1961. Most interesting of the L/R references is an article on page 11, titled 'Bluebird Reconnaissance', and written by Andrew Mustard. It casts light on the pre-event planning prior to Bluebird's runs, and hints at the effort required to transport the spares and technical equipment to be used by Donald Campbell, from the UK to Lake Eyre in Australia. The involvement of Land Rovers, it turned out, wasn't just restricted to moving equipment and personnel during the record attempts. Mr Mustard had been enlisted by Dunlop to fly to Lake Eyre and check out the venue as a potential site for a world land speed record attempt. On arrival, he was loaned a Land Rover by the local agent so that he, and a representative from BP, could assess the suitability of the area. He drove to Adelaide in the Landy, before transferring to three BP-owned examples, fully equipped to deal with anything that the harsh terrain might throw in their path. They was equipped with a "flying doctor" radio set, extensive medical supplies, food rations for two weeks, and twenty gallons of water per crew member on this reconnaissance trip. The Lake Eyre Basin extends to thousands of miles of salt beds, and the most suitable location for a record attempt in this vast wilderness had to be established, relying a great deal on local inhabitants' knowledge of the area. "Land-Rovers which made the reconnaissance possible are essential to the record attempt itself. They provide air for Bluebird's power brakes and fans for cooling them after each run, hydraulics for jacking and electric power for starting the engine." In the end, Campbell's 1963 record attempts would be dogged by frustration. Lake Eyre had been shortlisted because there had been no significant rainfall for 20+ years, baking the ground and making it a suitable surface to run on. Unfortunately, shortly after the team's arrival, the rain began to fall, with the Lake becoming flooded by late May, well and truly putting a spanner in the works. In 1964 Campbell would return, again with Bluebird CN7, and achieve his goal of a new world land speed record, but at a lower speed than he felt he could have achieved, had it not rained the previous year. But enough of speed, and back to Land Rovers, which are anything but speedy in standard fettle. Page 26 takes a look at the new Forward Control Land Rover, a curious-looking machine that sees the cab mounted above the front wheels, above the engine. Larger tyres were fitted as standard, and greater ground clearance was on offer, giving the new model an even better off-road capability, along with an increased payload bay. Buyers could choose from a number of different rear body configurations - dropside, fixed side, and a flat open rear deck. A hood could also be fitted over the load bay area, handy for the UK climate. P5 Rovers on the East African Safari Rally. Despite all this talk of 4x4s, it is the saloon car range of Rovers that predominate in this magazine. The first article whisks the reader to the East African Safari Rally, and recalls how well a team of four 3-Litre Rover P5 saloons performed in this gruelling event. Two cars completed the rally, the other two retiring through no fault of their own. One was driven accidentally into a "wash-away" (? ), whereas another P5 managed to get caught up on the parapet of a bridge. Cars behind the Rover towed it off but in the process damaged the car's suspension, forcing its retirement. Despite these interruptions, the team overall was very happy with the performance of the lumbering Rovers. All four had been entered under the name of the Cooper Motor Corporation Ltd of Nairobi. Liege-Sofia-Liege & the RAC Rally. P5s also starred in the Liege-Sofia-Liege rally held at the end of August 1962. Two 3-Litres completed the event (four had entered), the successful driver combinations were K. James and M. Hughes, and A.E. Bengry with D. Skeffington. They gained 1st and 3rd places in their class, and finished 6th and 18th overall. One Rover failed to finish as it ".. went over a cliff in a remote part of Jugoslavia, when a turn in the road was obscured by a cloud of dust" whereas the other had damaged its suspension when ".. it cannoned off a bus and hit a wall". I doubt the bus came out of that one too well either. Not all of Rover's rallying triumphs took place overseas though. Four cars were entered into the five-day RAC Rally, an event that started in Scotland, headed South in the direction of Wales, then onto the finish ramp in Bournemouth. One highlight of the week must have been seeing a stage held at the Oulton Park circuit, where bemused spectators would have witnessed four voluminous P5s racing wheel-to-wheel, one (Car no.20) in the hands of Raymond Baxter no less. A look back at the hectic schedule of Rover T.4, the latest gas turbine development car, during 1962 is recalled. The widespread use of gas turbines in road-going cars was something Rover believed would feature in cars before long, and they were keen to get a head-start. JET 1, a car reminiscent of the P4, had started the ball rolling, and by 1962 the T4 was under constant test and development. In April it starred at the New York Motor Show, alongside JET 1. In June, T4 popped up in France, and was demonstrated at the Le Mans track prior to the main event, enabling curious members of the motoring press to have their first experience of a gas turbine car. 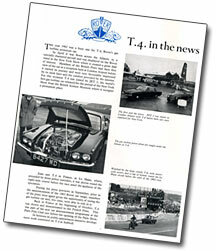 T4 would again go on show in France, in October '62, prior to the Paris Show. Big news for 1963 would be the unofficial entry of the Rover-BRM turbine car at the '63 Le Mans, driven by Graham Hill and Richie Ginther, a subject no doubt covered in a future issue of Rover magazine. As the new P6 2000 was still a few months' away, the stately P5 is featured in most of the articles. One article looks at the lengths that Rover engineers went to in testing each new car as it left the line. Internal and external finish must be flawless, and all controls function as intended - ".. all potential sources of annoyance must be eliminated". With a car completed, bar a few pieces of interior trim, it would be the Test Rectification Department that would descend upon it, pencils at the ready, poised to track down any imperfections before a new owner would get to drive their new car. Once they were happy that the basics were in order, the nuts all tight, and the screws suitable screwed, the car would then pass to the tester himself. Three laps (7.5 miles) of the test track would be driven, the tester's senses finely tuned to detect anything untoward with his machine. Before this though, a thorough inspection of the underbonnet area would be undertaken, as would another assessment of the car's bodywork. Once satisfied, off to the track they would head, with routines designed to test the Rover's suspension, transmission, engine and ancillary equipment. High speed brake tests would be performed on the final lap, before pulling to one side and the driver committing his observations to paper. If any faults had been detected, these would be rectified and the car taken out once more, for two laps this time, for a full examination. The process would be repeated until everything was deemed to be in order. A separate article looks into the world of noise & vibration testing, illustrated by various P5s bedecked with scientific test equipment. Photographs taken at various motorshows occupy pages 15 and 16. Glistening new Rover saloons are seen at the Geneva, Tokyo, and Sydney shows, while a 3-Litre Coupe takes pride of place at our own Earls Court. These tantalising snapshots of shiny new cars are followed by an article about an older P4 100, pressed into service during an Autocar roadtest of a brand new Sprite Musketeer caravan. These 'vans were positioned at the bargain end of the caravanning market, priced at £315 to you Sir/Madam, and the magazine's testers came away impressed at the value for money they offered.